3 - 4 Miles. 1½ - 2 hrs. This walk down Marple Locks has an option for an extended walk of another mile. Although the Peak Forest Canal had been opened for some years at the end of the 18th century, the construction of the locks was not complete until 1805 and a tramway linked the two sections. The walk is based on the original leaflet produced by the late Gordon Mills in 1998 and was first published on this site with his permission in the same year. The text here has been amended to include the addendum changes published in partnership with Marple Local History Society but has not yet been fully updated as part of our longer term programme to ensure that these historic guides remain available for people to enjoy. 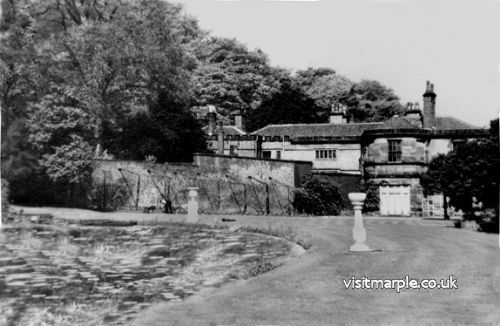 1) Our walk starts in the Memorial Park in the centre of Marple. There are two paths leading to the canal so which ever one you take turn left on reaching the towpath. 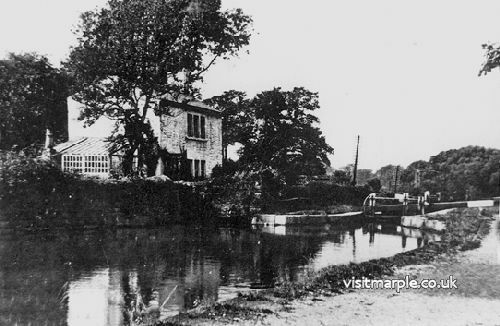 There are sixteen locks in the Marple flight which lowers the canal 208 feet to an aqueduct over the river Goyt. 2) Just above lock 9 is one of Oldknow's warehouses whose continued state of good repair is due to its conversion to offices. As we cross Station Road we cross the canal as well to take the tow path on the right of the canal. To our right is Brabyns Park which we will be exploring later. 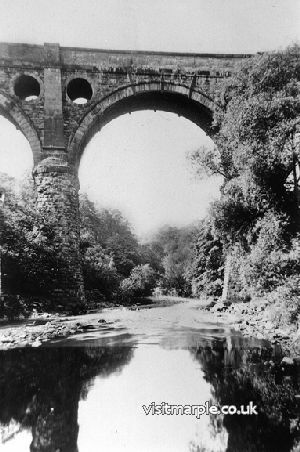 In the 1960s the aqueduct was damaged by severe frost preventing navigation and the whole canal became under threat of closure. 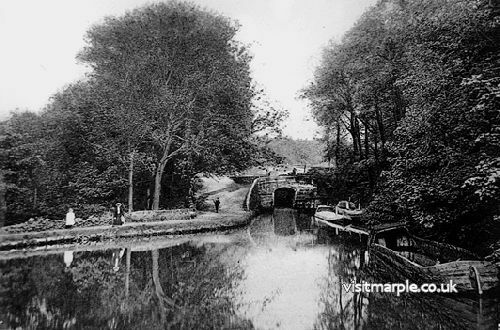 The campaigning and practical work by the Peak Forest Canal Society led eventually to the complete restoration of the locks and aqueduct. Between locks 4 and 5, where the railway passes beneath the canal, there is a picnic area with tables and seats. As you pass the locks look back at the small bridges that cross the canal just below the bottom gate. A carved stone face can be seen in the centre of the arch. Unfortunately these have become rather worn with the passage of time, but each lock had a different carving of a face. Doubtless some stonemason's personalisation of his craft. 3) Just before the bottom lock and the former lock keeper's cottage there is a footpath to the right. This is decision time. You can take this footpath [see Short Route below] or continue on the longer route past the aqueduct. Be warned - there are some rather muddy spots after heavy rain. 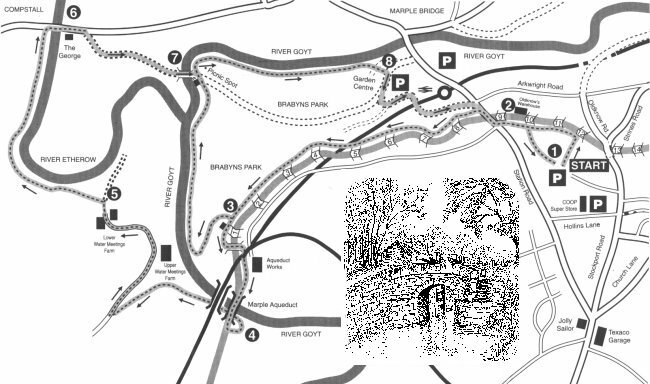 Short Route: Follow the signs marked Goyt Way down the hill and turning left to meet up with river. The path follows the river along a pretty tree lined path and past Water Meetings where the Etherow joins the Goyt. A little further on the path joins the main route. Below the bottom lock the towpath changes side and continues on under the railway viaduct. A short distance further on the canal narrows as it crosses the river Goyt on the Marple Aqueduct. This structure is over 300ft long and stands some 100ft above the river. 4) After crossing the aqueduct take a path on the left through a wooden gate that descends towards the river. The path leads steeply down but is "stepped" for ease of use. Passing under the aqueduct cross a stile and then bear left up the hillside towards another stile. Altogether there are three stiles to cross before a tarmac road is reached. Turn right and follow the road down past Upper Water Meetings Farm and then a short distance further on follow the red signs through the farmyard of Lower Water Meetings Farm. 5) About 150 yards beyond the farm, just before a gateway, leave the track and take a path to the left towards a stile. Follow the Valley Way signs until the river is reached. Cross the stile and follow the path as it runs alongside the river to the main road at Compstall. 6) When you reach the main road you will find there is no footpath over the bridge on this side of the road. So you will need to cross the road first, but do so with great care. Traffic speeds are high and the view to the right is poor. Turn right and cross the bridge and past what used to be "The George". Continue for about 200 yards before taking a track on the right signposted Brabyns Park. Follow the track and cross "Iron Bridge" which has undergone extensive renovation instigated by this web site and was reopened in 2008. After crossing the bridge take a path to the left alongside the river. The Iron Bridge in Brabyns Park. 7) The path follows alongside the river and past a picnic spot with tables and benches. A short distance beyond the sharp bend in the river is a weir. Follow the path past another weir where the path joins a track that passes to the left of the former Brabyns Hall walled garden. Carved in the stone over the top of the filled in entrance to the garden are the initials M. A. H. Brabyns Hall was the home of the Hudsons and the last occupant, Miss Fanny Hudson, acted as matron when the hall was turned into an Auxiliary hospital during the first world war. She was later awarded the O.B.E. for her services. 8) Cross over the tarmac road that leads to the former Garden Centre on the right and up a path that leads to the Car Park. This was the site of Brabyns Hall demolished in 1952. At the car park turn right and follow the road. After about 100 yards bear left at the fork. Take a sharp left at the next junction and follow the track whose end is marked with three metal posts. This will take you to a bridge that passes over the railway. The track climbs towards the canal and runs parallel before emerging onto Station Road by the side of the lodge. Cross the road and return to the canal towpath and back to the Memorial Park. This guide was originally designed and produced by Gordon Mills & Co. on behalf of Marple Community Council © 1998. 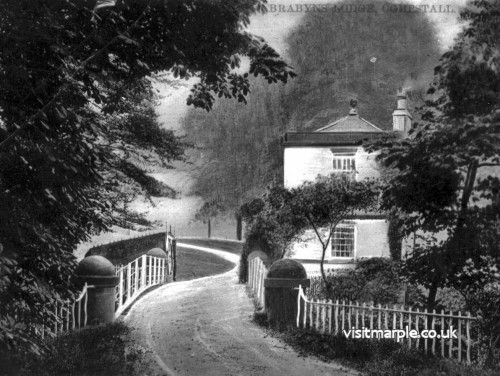 It has been reproduced with permission by The Marple Website and Marple Local History Society in memory of Gordon Mills 1935 - 2006. If you wish to show your appreciation, please make a small donation to the British Heart Foundation. Information on these walks is provided in good faith and is intended as a general guide only. You are advised to verify the accuracy of information before relying on it. It is the responsibility of individuals to approach outdoor activities such as walking with caution. Walking can be strenuous and individuals should ensure that they are fit enough before embarking upon it. If in doubt consult a doctor.